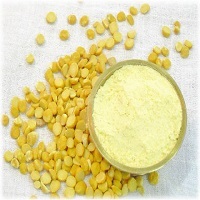 Besan also known as Gram flour is pulse flour made from ground chickpeas. Besan has been traditionally utilized widely for its beauty and health benefits.It is widely used in Indian cookery. Besan contains a huge proportion of carbohydrates and a higher proportion of protein than other flours.This food is low in Saturated Fat, and very low in Cholesterol and Sodium.Adulterants in besan include Tapioca flour, Khesari dal flour and yellow maize flour which are quite hazardous to health.